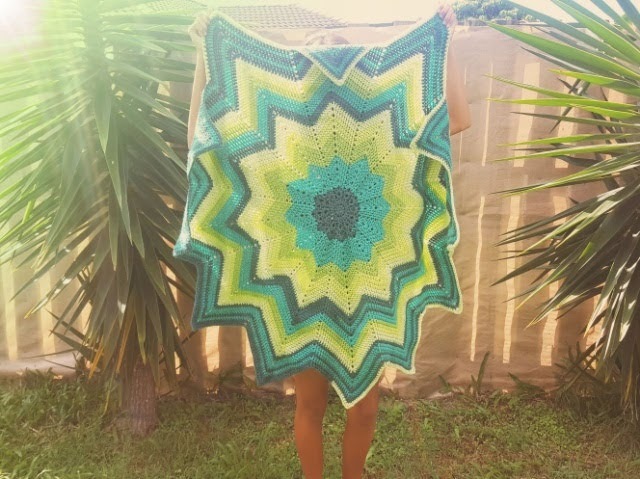 Naughts & Cross stitches: Green Rainbow Ripple is FINISHED!!! 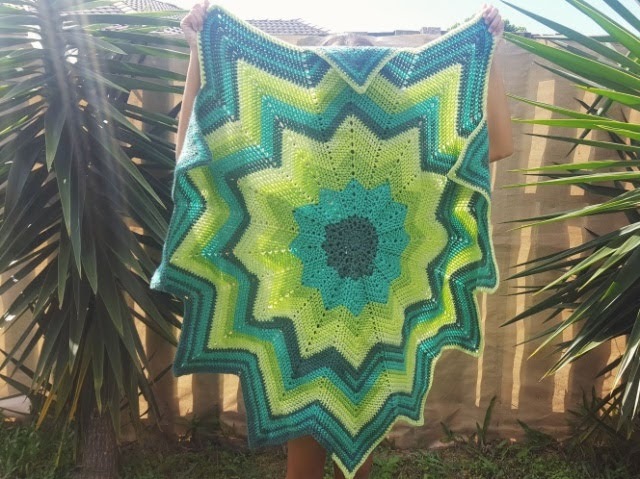 I am soooooo bloody excited to turn around and say one of the blankets is finished!!! Actually it has been finished for about 3 weeks now and I haven't had time to say boo let alone take photo. A bit of information before I show off photos. 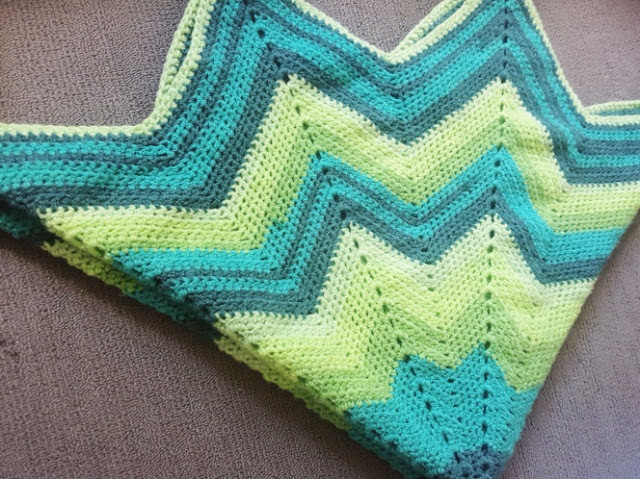 I used the rainbow ripple baby blanket pattern. It's a free pattern on ravelry, and I just kept increasing in pattern until I had enough. The yarn is a lincraft cake in greens. The colours are just gorgeous! And this will make such a wonderful present for my friend. It's difficult to get a good image I couldn't get the whole blanket easily in a photo. But these folded photos look cute. I did get some help holding it out in the sun but given it has 12 points she did a fantastic job. Then I played with filters in my editing app.... who needs an excuse? But now it has such a vintage summer vibe. I really like the way the effect on this one came out! I'm really looking forward to seeing my friend and getting baby cuddles. I'm also really happy with how it turned out. The colour changes aren't even but I think that adds to the effect with this blanket. I even had yarn left over that I've already used to make a couple of items. You can see a peek at one of them on my Instagram otherwise I'll be sharing about that very soon as I did manage photos on the weekend. I was very productive! 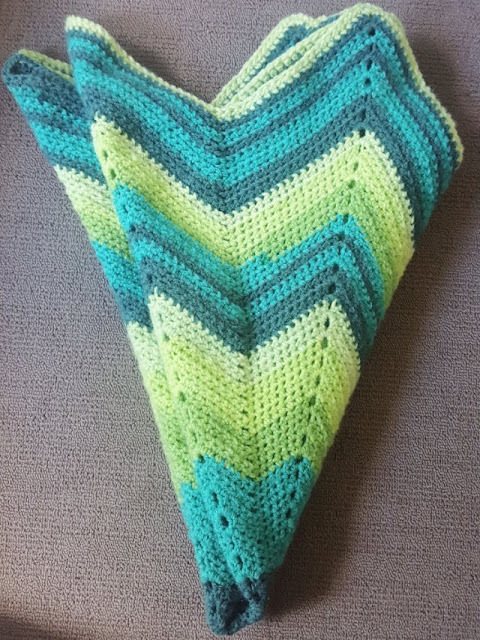 What gorgeous colours for a baby blanket! Great job. beautiful blanket! Love the colors! That turned out fabulous! Congrats and I know the baby will have lots of warm nights with that blanket!